Would you like your metrics hard or soft? Our team is getting smaller and smaller. The Imperial scale team, that is. Right now only the U.S. and Burma still use the Imperial system of measure. Even the British and Canadians have abandoned the system for metric units of measure. Most countries use a system known as “S.I.” or, System International. Dimensions on drawings are expressed as millimeters, usually without a suffix ( mm ) after them. With more and more films being made abroad it’s becoming more common for set designers and art directors to have to create construction documents that will be built out of the country. The easiest method is simply to draw in metric from the start and avoid some inevitably strange conversion numbers. Two other methods are the “soft” and “hard” conversions. In soft metric, you draw and dimension in Imperial and then also give the equivalent metric measurement rounded to the nearest millimeter. In hard metric you dimension in Imperial and then covert to “hard” or non-rounded numbers, meaning you’re going to end up with numbers in tenths of millimeters, which is fine if you’re drawing machined parts. Since a millimeter is less than 1/32″ in length, you won’t be very popular among the people building from your drawings. There used to be a company in Philadelphia called T. Alteneder & Sons which made custom drawing scales. 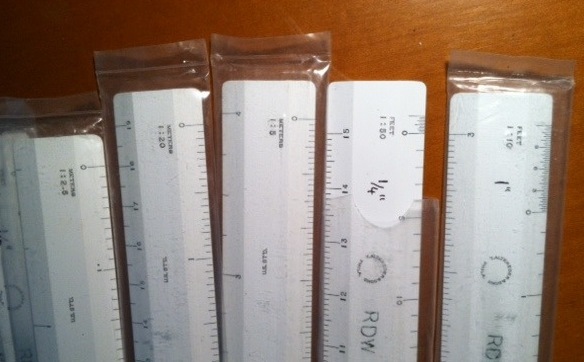 I ordered a metric / imperial set nearly 14 years ago and they’re very handy. If you can get your hands on a set, buy them. Since there doesn’t seem to a source to buy them anymore, I made up a paper scale set for 1/4″ / 1:50 that you can print out and make yourself. You’ll need a 1 1/2″ wide by 17″ long piece of matt board or thin basswood. Download and print out the PDF from the link below on 11 x 17 paper. Be sure to print it at 100% and make sure the “zoom to fit” box is unchecked. Check for print accuracy using the “Imperial” scale. It should measure a true 1/4″ to the foot. You’ll notice that the foot increments on the blue “Metric” scale measure slightly less that 1/4″ so don’t be thrown off by them. Carefully cut out the scales and mount on either side of the board. When working with a 1/4″ drawing, use the side with the yellow box marked “Imperial”. The opposite edge of the scale will read out equivalent metric lengths. Use the other side when working with 1:50 metric drawings and the ‘feet’ scale will give you the equivalent distance in imperial units.